The present Royal Theatre (Det Kongelige Teater), built on the site of a previous theatre at Kongens Nytorv, is home not only to plays but the Royal Danish Opera and the famed Royal Danish ballet. Since the Royal Theatre also operates in other locations, the present building, opened in 1874, is known as the Gamle Scene (Old Stage). Its 1300 seats make it slightly larger than the Royal Opera House in Stockholm, but it is still an ideal size for opera and a luxurious one for a work like "Lohengrin" that requires such massive forces. The production I saw was a revival of one first seen in 1986 directed by Nicolas Joël with Anne Fugl and designed by Pet Halmen. It is a relatively conservative production that keeps the action set in the 10th century as Wagner specifies. Lohengrin even enters wearing a helmet with swan's wings. Where Halmen has differed from Wagner's instructions is in emphasizing confinement of space. Only the scrim removed before each scene suggests that we are in open air on the banks of the river Scheldt. Otherwise, throughout we find ourselves confronted by three high walls of massive stone with steps leading to a single door in the back wall. In the council scenes a huge oak tree dominates the set. The tree, seemingly indoors, suggests both the traditional Northern European meeting place and looks forward to the indoor tree of another pair of Wagner's doomed lovers, Siegmund and Sieglinde in "Die Walküre". Halmen suggests that the action takes place after a recent clash between paganism and Christianity by placing a ruined statue of a figure with a horned helmet downstage throughout Act 1 where King Heinrich presides. In Act 2 where the pagan Ortrud dominates there are only two remnants of a colossal statue, a foot in a biblical sandal and a hand with two fingers raised in blessing. Her demands for revenge clearly contrast with Christian command to forgive. The confinement is broken by Lohengrin. When he arrives in Act 1 and departs in Act 3, two huge doors, otherwise unused, open of themselves as a blinding white light illumines the darkened stage. It's a marvellous effect and suggests that there is a world and way of thinking elsewhere far beyond what either the Christians or pagans can comprehend. Thus the director and designer visually highlight the philosophical implications of the opera. The only downside of this concept is that the space bounded by the three walls seems barely large enough to contain the massed chorus and principals at the same time. Joël and Fugl's direction was peculiar in that they drew detailed emotional performances from the principals while moving the chorus about often for merely decorative effect. It's true that "Lohengrin" is filled with formal marches and processions, but it would have enhanced the drama if the directors had encouraged more individualized reactions from the chorus. The cast was made up entirely of in house performers and one can only marvel at the wealth of talent the Royal Danish Opera has at hand. 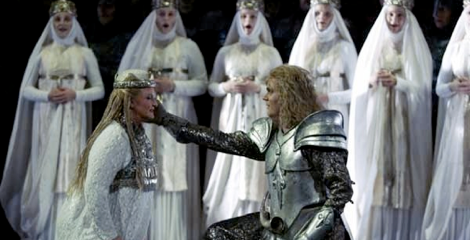 As Lohengrin, Johnny van Hal is a true "Heldentenor" with a beautiful glowing tone and an effortless sense of line. Some hoarseness did creep into his voice toward the end of the opera's five hours, but given the demands of the role that is almost to be expected. Van Hall was excellent at conveying Lohengrin's semidivine nature through a nobility of poise and demeanour, subtly relaxing them to bring out his human side in the in the fateful bedroom scene of Act 3. As soon as Elsa insists on asking the forbidden question, he seemed to shed his human side before our eyes to adopt the distant stance he had on his arrival. He gave a noble performance of his Act 3 narrative "In fernem Land". As sung by Irene Theorin, Elsa von Brabant was never the helpless female that she can seem in other productions. Her clear, powerful voice suggested a woman of great inner strength. When she treats the evil Ortrud kindly in Act 2, it did not seem like weakness but that she was acting according to her beliefs. Her performance throughout Act 3 was heartbreaking as Elsa struggles with herself over the forbidden question and then is overwhelmed with shame after asking it. This shame, both private and public made Elsa's death because of her loss painfully believable. The evil couple of Ortrud and Telramund, who scheme to ruin Elsa so that Ortrud's own family can rule, were forcefully sung and acted by Susanne Resmark and Kjeld Christoffersen. Christofffersen's magnificent baritone brought out the malice of his character in Act 1 and the pain of his defeat in Act 2. This Telramund did not seem weak-willed at all; rather Christoffersen made it seem that his overwhelming desire for power made him accept whatever plan Ortrud could devise to advance it. Resmark has a resplendent mezzo with seemingly no limits to its power. Her Ortrud positively seethed with malice and hatred and yet she could soften her tone enough when she makes her entreaty to Elsa in Act 2 to make Elsa's acceptance believable. After that her demonic prayer to Wotan and Freya was truly frightening--altogether an outstanding performance. The only disappointment among the principals was Anders Jakobsson whose watery bass suggested the age of King Heinrich but none of his authority. On the other hand, John Lundgren as the Herald sang with an ringing bass that made each of his appearances a pleasure. Det Kongelige Operakor sang the many choral sections with great beauty and precision. For this production the orchestra, Det Kongelige Kapel, swelled to more than 100 players. They did not seem quite as together at the start make the Prelude to Act 1 shimmer as it should, but by Lohengrin's entry in Act 1 precision of attack had returned and remained for the rest of the opera. Conductor Dietfried Bernet, who has conducted three other Wagner operas with the Royal Danish Opera, so varied the pacing of the work one could hardly notice that it is written almost entirely in 2/4 and 4/4 time. The famous Prelude to Act 3 was taken at breakneck speed, but otherwise he allowed the work the right degree of expansiveness to that the whole work seemed to breathe naturally. The production was so engaging that its nearly five hours seemed to fly by. There are very few opera companies in the world that can produce so fine a "Lohengrin" from their own in-house resources. The legend over the stage at the Gamle Scene reads "Ei Blot Till Lyst" meaning roughly "Not for Pleasure Alone". But I have to say this production brought such pleasure that I am anxious to see what these performers can do in other roles. Addendum: The Royal Danish Opera now performs at both the Gamle Scene and the new Operaen (see http://kglteater.dk). Note: A version of this review appeared in TheatreWorld (UK) 2002-06-16. Photo: Irene Theorin and Johnny van Hal. ©2001 Martin Mydskov Rønne.